who is Andre Kotsur ? Liam Harrison is one of the most recognisable names in UK Muay Thai and is coming of an awesome victory over Thai legend Anuwat in Manchester recently. But for those of you who are new to the European circuit we thought we would provide a little info on the man Liam Harrison is set to face on Sat 15th May at Rumble At The Reebok 2, Andre “White Cat” Kotsur. Andrei “White Cat” Kotsur comes to the UK on Sat 15th May to take on Liam “The Hitman” Harrision at Rumble At The Reebok 2 at the DeVerre Whites, Reebok Stadium Bolton. WPKA World Professional Champion 2009. His fight record stands at 123 fights with 113 wins (43 by KO) and 10 losses. His coach Evgeni Kotelnikov is the head coach and founder of the Kickfighter Gym. Kotelnikov is a graduate of the Belarus National Institute of Physical Culture & Sport Belarus and a Belarus national coach. Since setting up the Kickfighter Gym in 1989 he has been responsible for coaching 19 World Champions. Following on from the success of the Rumble At The Reebok shows, the promoters FightInc will be staging a Muay Thai show at the Olympia in Liverpool on the 20th June. The Olympia is a fantastic venue. Its been the home to North West MMA for ages and its great to see a quality Muay Thai promotion establishing itself at the venue. The show will be a mix of A,B and C class fights. The main event will hopefully see the return of a big Liverpool Muay Thai favourite but we cant say much as this stage. FightInc also promise to have some interesting matches in the pipe line. Stay tuned for more on this show as we get news. The brand new new Sandee custom fight gloves. Made exclusively for Rumble At The Reebok 2 – The Ultimate Lads Night. These gloves have been made exclusively for Rumble At The Reebok 2 – The Ultimate Lads Night Out and are not available anywhere else. FIGHTSHOP.com are UK distributors of Sandee Muay Thai Equipment. Following on from the spectacular success of the inaugural Rumble At The Reebok, Double Vision’s Rumble At The Reebok 2 – The Ultimate Lads’ Night has gone from strength to strength. The Ultimate Lads’ Night was initially planned as a small scale low key affair in one of the venue’s secondary function rooms. 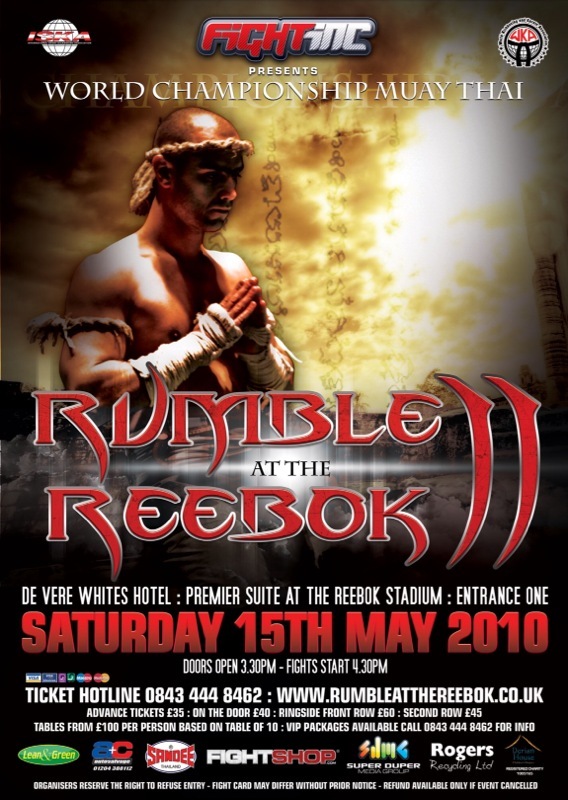 However, the outstanding success of Double Vision’s first event meant that promoter Darren Morris has now moved his second Rumble At The Reebok outing to the main event suite at the Reebok Stadium’s four star DeVerre Whites Hotel, vastly increasing capacity in order to cope with the upsurge in demand. 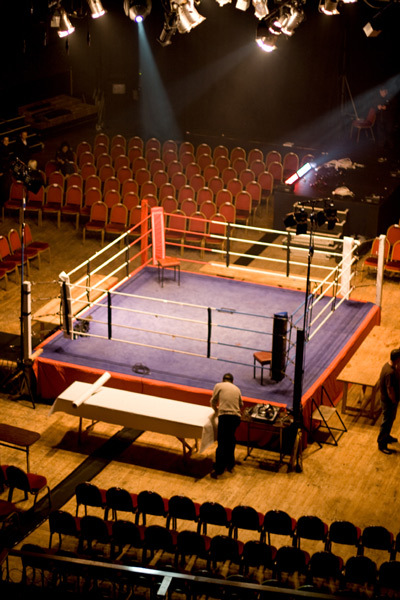 Interest in Rumble At The Reebok 2 – The Ultimate Lads Night hasn’t stopped there however. Double Vision’s partnership with the UK’s leading combat sports importer, wholesaler and retailer FIGHTSHOP.com and their specialist e-marketing division FIGHTPICS and combat sports blog FIGHTNUB has seen Rumble At The Reebok promotional material reach over 20,000 combat sports consumers in the UK alone. The effect of this intense and co-ordinated marketing campaign and partnership between FIGHTSHOP.com and Double Vision has now seen the Rumble At The Reebok brand being picked up on European fight forums. Once such forum, the Dutch site FIGHTTALK.NL, saw a Rumble At The Reebok post made by a Dutch resident receive over 150 views in little over 20 minutes and it isn’t stopping there either. One thing is for certain, the Rumble At The Reebok brand is going places that no other UK promotion has been and fighters who appear on any of their future shows are going be appearing on a platform that will do wonders for their profile and fight careers not to mention the sport of Muay Thai in general. Rumble At The Reebok 2 – The Ultimate Lads Night takes place this Friday 14th August at the 4 star DeVerre Whites Hotel at the Reebok Stadium Bolton.